Many of you all posting here will whine that when it comes to productivity software, OpenOffice rocks, or Pages or Google Docs is all you need. I hear the same crap from pundits on all the tech podcasts. Apple and Linux fanboys have their noses so far up in the air they may drown next time it rains. 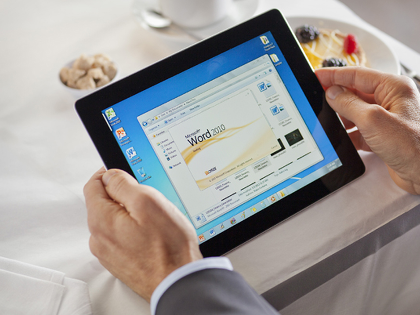 Listen up peeps… the business world runs on Windows/Office. Over a billion users every day heads down pounding away on their computer keyboards (not glass panels) using Excel, Word and yes even PowerPoint and Outlook. Be snobs if that makes you feel all superior but it appears even Microsoft is finding it’s way back home after the Windows 8 disaster. Pages is for dummies. Numbers is for morons. Word and Excel is for proper work. And they are now available on the popular iPad. Finally. Steve Ballmer lost his CEO role at Microsoft when first the iPhone and then Android rocked the computing world by delivering a proper computer for your pocket and Microsoft had no answer for three long years. And when they finally responded with a touch first Windows 8 Nokia Phone and Windows 8 OS running on Surface tablets the world went, “Huh? Ballmer, what are you doing?” and the board kicked big Steve to the curb. The latest Windows 8 PCs are step-by-step moving back towards a PC look and feel. And so the computer industry’s biggest mistake since Windows Vista is being gradually being undone. I may actually buy a new Windows machine later this year as a result. The price of Windows Phone 8 software is now free so maybe now the Chinese handset makers will start cranking them out. But we all know the travelling sales guys and executives love their iPads. They look swish in front of the clients and staff as they say, “hey – I’m hip!” in meeting rooms. iPads are also fun for those idle moments in the hotel room when one needs a little diversion. So now when the staff put together a complex spreadsheet or PowerPoint the boss can make a few changes on the fly and do the demo in front of the client. The heavy lifting is done back in the office on a Windows/Office PC and the swish presentation with the iPad. Perfect. It’s about time Microsoft. Maybe you’re getting back on track.